When early settlers arrived in East Texas, they discovered a vast forest comprised of a variety of both pine and hardwood species. Pines, for the most part, dominated the uplands while hardwoods dominated the bottomlands. The common pine species were shortleaf, longleaf, and loblolly. Although some overlap of pine species did occur, each species was generally restricted to a specific geographical area. Bottomland habitats along rivers, swamps, and associated drainages were interspersed throughout the area. The following is a brief description of each of the major forest types. 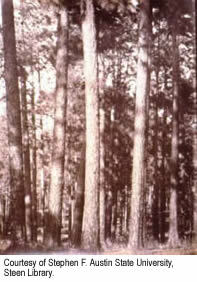 The shortleaf pine forest type was located in the northern half of the Pineywoods. This area was generally bordered by the Red River to the north, the Louisiana border to the east, Hopkins county to the west, and Angelina and Houston counties to the south. North of the Sabine River, from Longview through Cass and Bowie counties, the shortleaf pine formed compact forests. Over the remainder of the shortleaf area to the south, a hardwood component became more prevalent in much of the area, but stands of pure pine were also intermixed. The intensity and frequency of forest fires likely controlled the frequency of occurrence of the less fire tolerant hardwoods. Since the first railroads were cut through this area, the harvest of the shortleaf timber began earlier than that of the longleaf and loblolly timber. In 1880, it was estimated that 146 million board feet of timber were harvested. For the most part, little attention was given to the reforestation of these areas and hardwood began to occupy many of the sites. However, pine did regenerate successfully in some areas. Many sites, especially on loamy soils, were cleared for cultivation. The longleaf pine forest occupied approximately 5,000 square miles of the south central Pineywoods. The area was bordered by the shortleaf pine area to the north and extended southwestward to the Trinity River, where the overlapping area of shortleaf and loblolly pine formed its western boundary. The longleaf extended east to the Louisiana border, and as far south as the level Gulf Prairie. Longleaf pine typically occurred in pure stands, with a grassy understory, especially on the sandy ridges. Early travelers commented on the "openness" and monotony of these forests. Travelers made comments to the effect that the trees were so openly spaced that a carriage could travel almost anywhere among them and one could see a great distance. These areas were often referred to as "pine barrens". Early records indicate that these longleaf forests burned regularly, perhaps as often as annually in some areas. This was evidenced by the abundance of grasses, and the lack of longleaf regeneration in many areas. After the first or second year of growth, longleaf seedlings are fairly fire resistant. However, during the first couple of years, they are susceptible to fire. The lack of longleaf regeneration provided evidence as to the frequency of the fires in many areas. In other areas, where fire was not present for a few years, longleaf regeneration was abundant. Most fires had little, if any effect on the mature trees. The purity of these stands, combined with the excellent quality of the timber, made these longleaf forests the most valuable and easily marketed timber resource of the state. Due to the openness of the forest, loggers found it easy for the mules and oxen to maneuver the logs between the standing trees to waiting railroad cars. During the early 1900's, it was estimated that 750 million board feet of longleaf timber were harvested annually. Little consideration was given to regeneration of the stands. However, in some areas where fire was absent for a few years, natural regeneration was successful in establishing seedlings. The loblolly pine forest was estimated to occupy an area of approximately 7,000 square miles and was located to the west and south of the longleaf region. The loblolly region extended south to the interior of the Coastal Plain. This area was characterized by a slightly undulating topography. Low ridges of sandy loam soils were interrupted by lower areas of clays and silts, which were wet during certain times of the year. The ridges were primarily comprised of pure loblolly, while the lower wet areas were comprised of hardwoods with a mixture of loblolly, and a dense understory. Loblolly pines were also found sporadically in the associated creek and river bottoms. The intensity and frequency of forest fires likely controlled the frequency of occurrence of the less fire tolerant hardwoods. Loblolly was of commercial value, however the Galveston Storm of 1900 felled many thousand acres of timber and made logging difficult. Little attention was given to regeneration of these forests, and many of the stands were cleared for cultivation of sugar cane, rice, and other crops. Oak, ash, hickory, gum, and cottonwood species were common along the major river drainages such as the Trinity, Red River, Sulphur, Sabine, Angelina, Neches, and Attoyac. These hardwood trees grew very large in the rich bottomland soil. Early accounts described oaks, ashes, and hickories up to diameters of 6, 4, and 3 feet, respectively. Much of this timber was being harvested and rafted out along the rivers. Local factories were being constructed to utilize the hardwood material. In addition to the commercial harvest of the bottomland forest, settlers were clearing the forests for settlement and agricultural production in the nutrient rich soils. The Pineywoods landscape has changed drastically over the last 100 years. 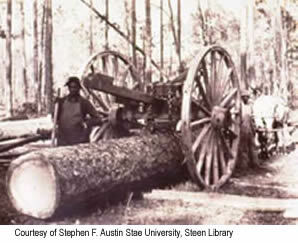 Many human-induced factors have influenced the dynamics of the east Texas forest. A recent survey (1992) of 43 east Texas counties estimated that there were 11.9 million acres of forest and 9.7 million acres of nonforest land. Most (62%) timberland was nonindustrial private forest land (7.3 million acres). Industrial timberlands comprised 32 percent of the area. The predominant forest type in east Texas was the loblolly-shortleaf pine type (35%). Bottomland hardwoods comprised 15 percent of the area. The least common forest type was the longleaf-slash pine type (2%). In most areas, the virgin forest has been harvested several times over the last century. Thinnings and clearcutting account for the most common harvest methods. Following harvest, some areas are allowed to regenerate naturally, while others are planted. The most common species planted is loblolly pine. In many cases, competing hardwood vegetation is controlled by herbicides or mechanical means which favors the establishment of pines. This has resulted in thousands of acres of pine plantations, that have little, if any hardwood component. A recent survey indicated that 22% of all timberland was classified as pine plantation. Most (72%) plantation establishment was on forest industry lands. The 1992 survey indicated that approximately 71% of the plantations were less than 20 years old. A very small amount of the historic longleaf range area is currently occupied by longleaf. Difficulties associated with regeneration of longleaf pine, conversion to loblolly and slash pine forests, and the absence of fire has reduced this forest type to less than 10% of its former range. Most of the longleaf forests that remain are not typical of the historic longleaf forests that were maintained by fire. The southern yellowpine ecosystem evolved with periodic fires, either from lightning strikes, or the practice of Native Americans. Fires would spread across vast areas, driven by an abundance of highly flammable ground fuels such as pine needles and grass, and the lack of man-made barriers such as highways and lakes. In the absence of periodic fires, the grass community disappears and is replaced by shade tolerant hardwoods. 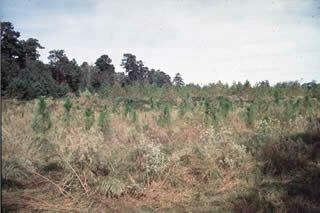 The loss of this pine Savannah type habitat has led to the decline of many species that were once associated with it. Examples include red-cockaded woodpecker, Louisiana pine snake, northern bobwhite, eastern wild turkey, and Bachman's sparrow. Much of the area previously occupied by bottomland hardwood forests has been converted to other uses. Many thousands of acres of bottomland hardwood forest have been lost due to reservoir construction. The construction of dams along major river drainages has resulted in the upstream flooding and loss of bottomland hardwood forests. As mentioned previously, these bottomland areas contain highly productive soils. Therefore, thousands of acres of bottomland hardwood forests have been lost due to conversion to agricultural production.